Samsung has revealed that the Samsung Galaxy Tab is likely to make 1 million sales in 2010 – a figure which was reached by the Apple iPad in just one month. Samsung seems to be pleased with how its tablet device is doing in the market, though, with JK Shin, the head of the company's mobile division, revealing that despite some delays the device was on track with expectations. "Although the launching of Galaxy Tab has been delayed a little bit (in Korea), consumer responses in Europe and Asia have been quite good and we are confident of meeting one million sales mark this year," said Shin to journalists this week. Even though the iPad made 1 million sales in one month, an FT report earlier in the month noted that Apple had still not hit its own targets – which were 5 million by the end of September. This is a figure ended up being 4.2 million. 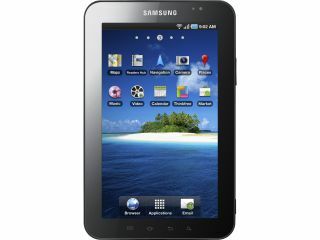 Samsung seems confident, however, that 1 million sales is a significant part of the tablet market. This is despite the iPad's obvious dominance in the market, which was revealed this week to be a massive 95.5 per cent of tablet sales.